Well would you look at that? It’s the 30th blog, that’s quite something. It doesn’t mean much in reality, but hey, it’s a pretty number right? Since the last blog we’ve mainly kept on adjusting balance issues, fixing bugs and overall polishing features, so this blog won’t be very long as much of what we’ve been doing are smaller tweaks to textures, testing and doing other things that aren’t that fun to show here on the blog. However, we have found the time to add some stuff that we feel have been missing for a while. So lets get to it, shall we? When you’ve been living the raft life for a little while and you start building up a bit of a stash, you’ll of course have to store all this stuff somewhere. 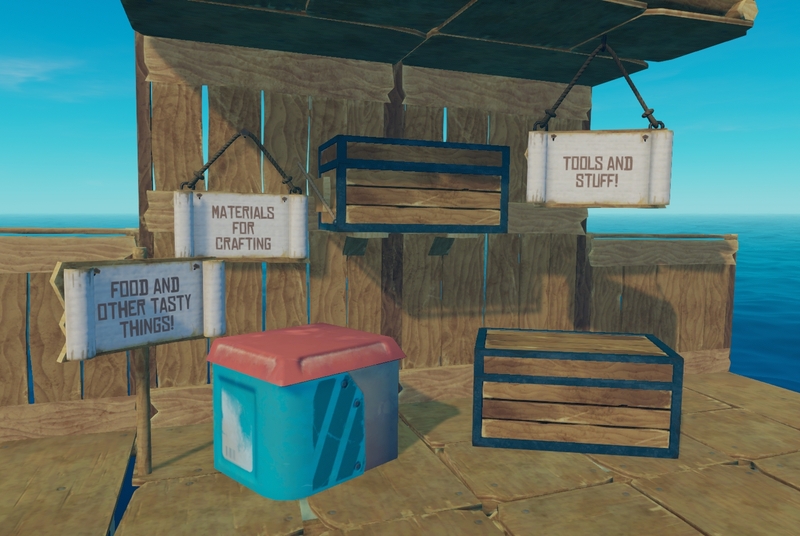 And for those of you who like to have order among your chests, we’re glad to introduce signs! 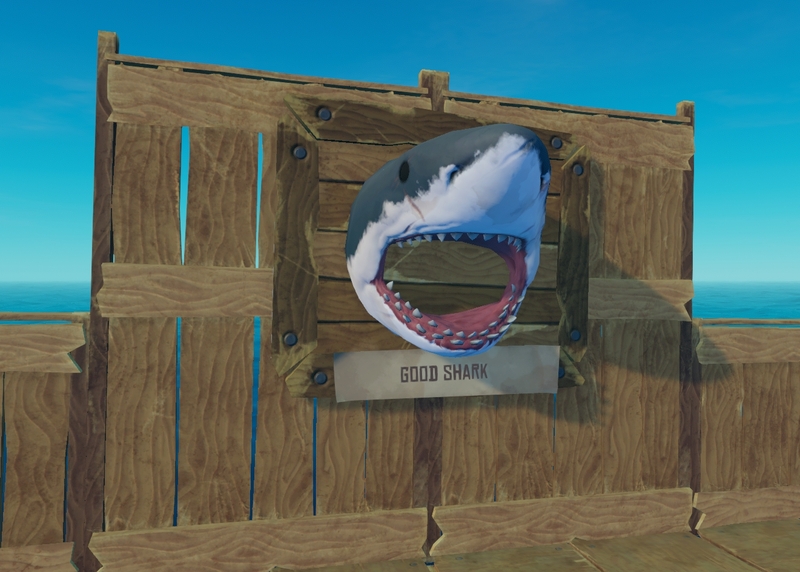 Additionally, we’ve noticed many of you like to name the shark, so it felt obvious that you should be able to actually put a name to the face. 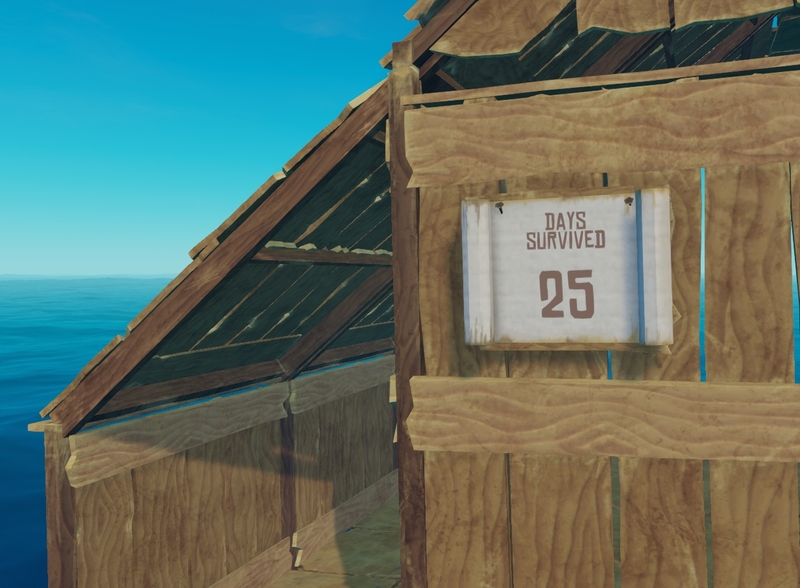 While we were at it, we also added a calendar so you can keep track of how many days you’ve survived on your raft. We decided put some time into polishing the fire effect. The old one felt a bit rigid, which is generally not an adjective used to describe fire. What do you think? Speaking of effects, we’ve also added some swell after the raft to further anchor it to the world and make it clearer which direction your going. That’s all for this time! As always, we’re very happy to hear what you think of the additions and changes! Hope you have a great weekend! Until next time! Love seeing your progress every week on this game, I know I’m going to have a great time with it in the future. i am looking at all blogs and reading them from begining to end. but will there be another update for us to play before game launches or we can play newest version only when game realeses ? Progress looking great! Can’t wait for this game to be available to play. I have a request for the decor, and also sort of survival side. I would really love to be able to set out food on plates! (Which you could set down on tables of course.) I want to be able to basically set up a banquet of different foods for myself and either my guests, or the imaginary friends that I’ve made up because I’ve been alone all by myself on a raft 😛 Would absolutely love to see that! I honestly like the earlier fire effect. Pls add something that can scare away sharks or some kind of reinforced foundations that the shark can’t break or takes really long time for the shark to break. There are already reinforced foundations but i think it would be a great addition to add a extra strong foundation that the shark is unable to destroy. If you are not releaseing anymore *live* versions that people like us (the community) can test and report back on? they took a break from the public releases to make sure that the game they make in done properly and not stressed work. Could you add spikes that harm the shark and fishing nets. When will be coming out on the PS4?